With its new Hydro+ technology, Hydro Green Energy is now generating additional power downstream from an existing hydro dam in Minnesota. The Hastings, Minnesota facility uses Hydro Green Energy's Hydro+ hydrokinetic technology to generate more power downstream from the existing 4.4 MW run-of-river hydropower plant on the U.S. Army Corps of Engineers' Lock & Dam No. 2. It's now possible to install additional power generating units downstream from existing hydro dams and multiply the amount of power generated from the flowing water. That's only part of the new, value-adding technology that Hydro Green Energy LLC has brought to market. America's first commercial hydrokinetic power plant-owned by the City of Hastings, Minnesota and operated by Hydro Green Energy-has started selling power into Minnesota's grid. The project demonstrates the viability of yet another type of alternative energy that is really about capturing more value from a lot of existing infrastructure. Hydrokinetic power is the generation of electricity from moving water without the use of structures, like dams, that are typically used at conventional hydropower facilities. What's particularly attractive about the source of this green power is that it can operate in base load fashion, meaning that the system will deliver energy as long as the water keeps flowing. Except for tidal applications, hydrokinetic power is not an intermittent renewable power source. The Hastings facility uses Hydro Green Energy's Hydro+ technology to generate more power downstream from the existing 4.4 MW run-of-river hydropower plant on the U.S. Army Corps of Engineers' Lock & Dam No. 2. The project holds the first hydrokinetic license granted by the Federal Energy Regulatory Commission. A Hydro+ installation consists of a floating platform secured by five concrete deadweight anchors that lie on the floor of the hydroelectric plant's scour protection area. Found downstream of hydropower plants and dams, the scour protection area is a concrete and rock-lined area that prevents erosion at the site from strong flows and preserves the structural integrity of the dam and power plant. 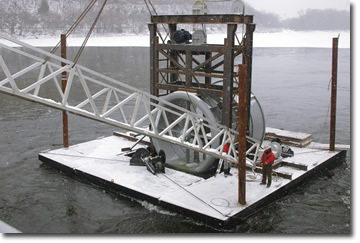 Suspended from the floating platform is a 12-foot, three-blade, ducted underwater turbine that can be raised and submerged, as required for maintenance. The flow of water exiting from the existing hydroelectric dam is what turns the turbine. A surface-mounted (above water) generator delivers power from the hydrokinetic turbine to the existing hydroelectric plant's power house for delivery to the grid. The hydrokinetic platform can be easily moved to find the flow "sweet spot" if there are significant flow changes or variations, and it can be easily removed from the water in the event of a flood or other emergency. In addition to existing hydropower facilities, this technology can also be installed in open rivers and tidal areas. A variation of the technology can be integrated into existing lock and dam structures, non-hydro dams, and at cooling water systems at thermal power plants. The eight-year-old company, based in Houston, Texas, and founded by company president Wayne Krouse, has developed a core of modular technologies that can be applied and modified according to project requirements. 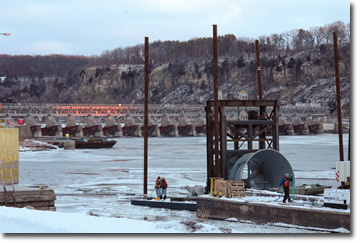 As part of the installation process in Minnesota, Hydro Green Energy discovered the potential of installing a variation of its technology at existing lock and dam sites. "I spent a lot of time out on the project site in Hastings for the Hydro+ project facility-there were a couple of locks there, and they were fairly simple in construction," says Krouse. "I was looking at those lock doors every single day, and it got me saying, 'gosh, it would be great if we could develop a system where that would be the application point, because it can reduce the cost of the system significantly since you already have the infrastructure in place, and our system is a modular design.'" A system of locks and dams was developed throughout North America over the last century to allow boats to travel from one body of water to another. Essentially, a lock and dam system is like a set of stairs, where by controlling the flow of water from one step to the next, boats can be elevated or dropped, depending on the direction they are headed. There is tremendous water flow when lock gates are opened and closed. Recognizing the power-generating potential that this water flow represents, Hydro Green Energy has developed a unique, new technology called Lock+. "The Hastings technology represents an initial core technology platform," says Krouse, "and we are taking many of the same designs that were demonstrated in the Hastings system to do the same thing for Lock+. It is a very similar approach, trying to build off of a common set of sub-systems and sub-components." The Hastings project is not a realistic reflection of the actual cost of a Hydro+ location, says Krouse, because it was largely a testing and proving ground for this technology. Over a period of three years, Hydro Green Energy built prototypes (one-sixth and one-third scale) of their hydrokinetic turbine. "After we had gotten through the end of that program, we were confident that the numbers we were seeing were what the equations would predict," says Krouse. "So we made the conscious decision to jump from prototyping to commercialization." The company is well aware that the first installation at Hastings is significantly over-engineered. "We know that the Hastings cost is not representative of what we expect to see in our production version," says Krouse. "But it allowed us to get into the water, to be first on the market, and to prove that the technology works." With that now accomplished, Hydro Green Energy expects considerable cost savings from a second Hydro+ unit being installed at the Hastings location. "Ultimately, I think we are going to end up being in the $3,000 to $3,500/kW range," says Krouse. "We think we can get there with the second generation unit." The nameplate rating on each Hastings unit is 100 kW. Based on existing infrastructure, Krouse believes there is tremendous potential throughout North America for all four of the company's patented technologies-Hydro+, Lock+, Efficiency+, and River+. Efficiency+ is similar to Lock+ but is aimed at cooling water discharge systems at thermal power plants. River+ consists of multi-unit, multi-array hydrokinetic power systems installed in open rivers. These projects can range from 50 kW to 50 MW in size. What's enticing to investors is that Hydro Green Energy claims it is able to construct and commission a power project in approximately 18 months. Deploying the technology as part of existing hydro projects or existing infrastructure offers the added bonus of minimal tie-in costs, since the transmission infrastructure is already in place. At present, hydro accounts for about eight percent of U.S. power generation. Krouse believes that by deploying technology to generate power from wherever there is sufficient flowing water-like the technology developed by Hydro Green Energy-the percentage of hydro could double to about 16 percent. And that's only taking a small part of the world into consideration. "There are a lot of opportunities in low-head hydro on a global basis," says Krouse. Low-head hydro dams are those using lower profile walls to hold back flowing water as compared to projects like Hoover Dam. "If I had to take a guess, considering that there is one-quarter of a terawatt available for development in just the U.S. and Canada, I would imagine that the global potential is probably two or three terawatts total." Green Energy's Hydro+ system involves submerging a 12-foot, three-blade, ducted underwater turbine from a floating platform. The flow of water exiting from the existing hydroelectric dam turns the turbine. A surface-mounted generator delivers power from the hydrokinetic turbine to the existing hydroelectric plant's power house for delivery to the grid. Since Hydro Green Energy's technology has the potential to increase capacity at existing low-head hydro dams or at non-hydro dams, as well as lock and dam systems, it will help bring down the cost of installing this infrastructure. Krouse says regardless of whether a low-head facility or a large facility like Hoover Dam is being built, there are certain fixed infrastructure costs. Undeveloped low-head facilities tend to be very expensive to build, given the amount of power they actually generate. However, by deploying Hydro Green Energy's Lock+ systems, the upfront costs are much easier to justify. "We think we have developed a system that can cut those civil costs anywhere from 30 to 40 percent," says Krouse. By decreasing costs to that extent, the company makes it possible for entirely new categories of investors to consider financing low-head power generating systems. There is tremendous potential capacity that represents the low hanging fruit. Krouse feels that building in the capacity to generate power, from the water flow created by the opening and closing of lock gates, is a prime opportunity for their Lock+ system. variety of patents out there around it already and an additional set of patents pending. We think it gives us a way to do low-head hydro at a cost advantage of 30 to 40 percent less than other types of technologies." What's also attractive about this opportunity is that the company estimates that projects using Lock+ technology can generate anywhere from five to 20 MW of power, depending on the elevation between the upper and lower pools of a project site. Attaching Hydro Green Energy's system to an existing lock infrastructure does not present a major engineering challenge in many instances, Krouse adds. Many systems in the U.S. have designed a spare auxiliary lock into their systems, which could be used to install the Lock+ system. It would require minor modifications, such as the installation of another gate downstream from the existing, unused gate to control the water flow. But the benefit of installing the system at this location is that it would not interfere in any way with the flow of traffic through the locks. "Our gate becomes an extension of the existing impoundment system, so we start generating power there without interfering with the locks." The company is already in serious discussions with a number of customers interested in its Lock+ technology. Louisiana, Maine, Minnesota, Mississippi, New York, North Carolina, Texas, and Wisconsin.